Nintendo players needn't wait too long. Layton’s Mystery Journey: Katrielle and the Millionaires’ Conspiracy will launch for 3DS in North America and Europe on October 6, Level-5 announced. The Nintendo 3DS version of the game includes more puzzles than any game in the Layton series thus far, and what’s more, bonus puzzles will be available to download daily for one year, starting from launch day. 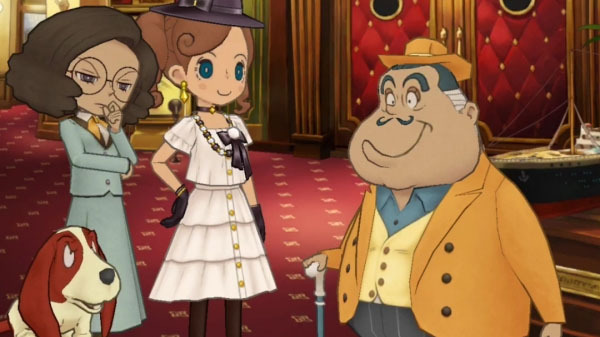 With additional minigames to round out the package, puzzle fans will find plenty to keep their brains occupied as they explore the charming and visually rich world of Layton’s Mystery Journey: Katrielle and the Millionaires’ Conspiracy. The story this time begins with Katrielle setting up the Layton Detective Agency on Chancer Lane, determined to prove her worth and hoping that the exposure will help her to uncover clues regarding her missing father’s whereabouts. Whizzing around London on her trusty bicycle, solving case after unlikely case, Katrielle will become embroiled in a quizzical quest that eventually leads to her unwitting discovery of the Millionaires’ Conspiracy. However, she’s not alone in her endeavours – a young Gressenheller student by the name of Ernest Greeves joins the agency as her assistant, and the team quickly grows to three when Sherl, a talking dog, becomes Katrielle’s first client and subsequently a trusty sidekick. With the intuitive, Touch Screen-based gameplay that fans know and love, Layton’s Mystery Journey: Katrielle and the Millionaires’ Conspiracy is as easy to pick up and play as any of its predecessors, and can be enjoyed on any system in the Nintendo 3DS family, including the recently-released New Nintendo 2DS XL. Layton diehards, casual puzzle-solvers and newcomers alike will quickly become immersed in the brain-teasing adventure as they help Katrielle discover clues, solve puzzles and ultimately deduce the truth. Fashion-conscious players can also redecorate the agency and dress Katrielle in various different outfits to suit the case at hand. With the most puzzles ever included in a Layton game, a colourful cast of new characters, a hatful of humorous dialogue and an intriguing new storyline, it’s time to say hello to a new heroine and a new era for the Layton series! Will Katrielle and her friends ever be able to find her missing father? Layton’s Mystery Journey: Katrielle and the Millionaires’ Conspiracy launched worldwide for iOS and Android in July, as well as for 3DS in Japan.